I feel the need to write a long-overdue ode. An ode to Mommy and Daddy’s little helper. I owe the makers of this .99 app a lot more than a blog post (and my .99 cents). But, Swirly Studios, I’m not sure if we can put a price tag on my sanity. We’ve been having some problems getting out the door on time in the mornings. Sometimes, it’s my fault or Mr. Wonderful’s, but mostly, it’s the kids’ fault. I’m the mom who blames her kids. Everything takes forever because they’ll start to get a shirt on, notice a toy, start playing with it while one arm is in a sleeve and the other isn’t. There’s no rush with these kids. Unless they’re racing each other. Then, it’s body checks and taunting. If I do have their attention, it’s for the wrong reason. They have their eye on my as they gleefully leap just out of reach. It’s game time, then. Mr. Wonderful found Lickety Split and, honest to goodness, this app has made life so much easier. Basically, it’s an audible countdown, and if you beat the timer, you get a reward (though, the reward is just an animation on the screen, it’s a BIG deal for my kids). 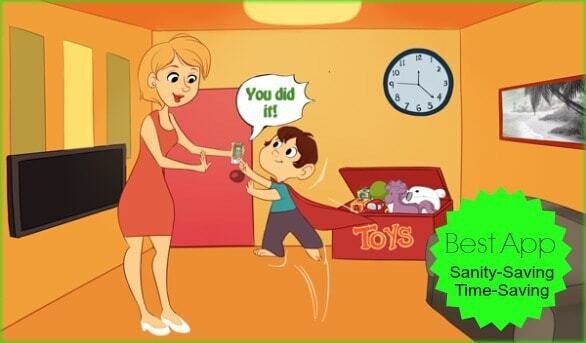 My kids live for pushing the “I did it!” button. The classical music’s nice and keeps the competitive aggression in check and instead kind of soothes. Tempo picks up near the end of your time limit, so for kids who can’t read the countdown clock, they’re still grasp that time’s almost up. Whenever the kids start to dart out of my reach during our morning routine, I break out Lickety Split, harness their competitiveness and things get done. Clothes changed, socks on, boom! This app works for most things you need to set a time limit on. Picking up rooms, limiting bath time, that sort of thing. They also have a non-countdown timer good for studying or reading – so if you hit the “finished” button too early, you get a “waa waa” sound. So in conclusion, Lickety Split, I heart you. Your turn: What helps your family get out the door on time in the morning? I don’t have the booming social where a girls night out needs to be more than just drinks. I’ll take anything if it means I don’t have to say “potty” in a conversation. But, it is fun to be out with friends doing something in addition to having a drink. Being creative while drinking, for instance. 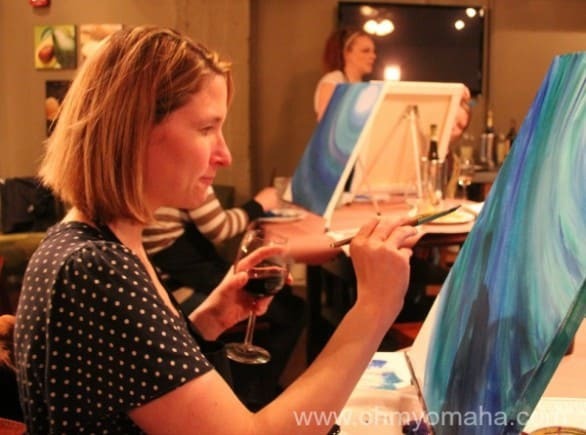 I don’t always paint while holding my wine glass, but when I do, I’m sure to slosh my wine on my apron. 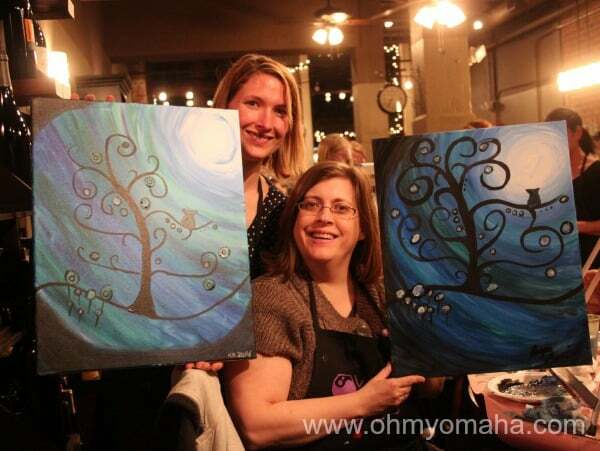 I recently took another Vino Van Gogh class (read about the first one here). This time, it was a special night out – a birthday celebration for my sister-in-law (belated, but she doesn’t mind). So, we sipped some, painted some, laughed a lot. Here we are with our finished masterpieces. My first experience was similar. Vino Van Gogh classes are held at different locations around Omaha – from bars to restaurants to retail locations like the one we were at recently, Vine + Branch. The location is different each time but I’m learning that the atmosphere is similar: Relaxed, supportive and festive. Two different teachers, two different styles, but both were encouraging with a side of sass. You aren’t going to learn a lot of technique just enough to help you paint something like this. So if you’re looking for more instructional painting classes, perhaps look for a different sort of school. It’s mostly women in the class, though my first class had a few couples on dates. Drinks and food are additional costs – you’re not required to drink (it just helps). I found a glass of wine loosened painting inhibitions – we started out worrying about every brush stroke, but about 20 minutes into it, woowee, who cares, let’s add a little more color here and a little swoosh there. Do you have a need to tap into your inner-artist? Does the sound of painting with a glass of wine within reach sound just about right? Do you have three friends who need a night out? Or maybe you have a special someone who’d join you on two dates to two different classes? Lucky you, then. I’m giving away FOUR (4) passes to any Vino Van Gogh class in Omaha on any day you choose (assuming it’s not already a full class). The passes are codes you’ll use when registering for the class(es) of your choosing. It’s easy to enter. You can get extra entries if you follow us on Facebook, Twitter and Pinterest, plus you can tweet about this giveaway daily for an extra entry each day! Must be 21 or older to enter. Giveaway ends at 11:59 p.m. on April 27. A random winner will be selected by Rafflecopter, and I will contact that winner via email with details on registering for the class(es) he or she wants to attend. Total value of the tickets is $152. Vino Van Gogh provided complimentary classes to me in exchange for my honest reviews. All opinions expressed are my own. I want to thank the sponsors who are making Oh My! 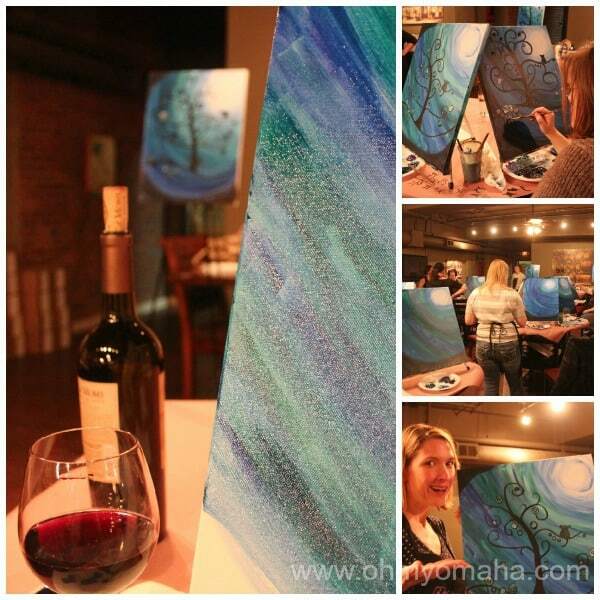 Omaha’s birthday celebration so awesome, especially Vino Van Gogh for providing the four free class registrations for today’s giveaway! Other great sponsors are Omaha Symphony, The Rose, Omaha Performing Arts, Omaha Children’s Museum, the Strategic Air & Space Museum, and Bluebarn Theatre. Last summer, Omaha Performing Arts presented a production that wasn’t your typical Orpheum Theater fare. It had women hooting and whistling. It had me laughing to the point of tears. What made women catcall at the grand theater while also making them laugh? It was a parody of “Fifty Shares of Gray” with funny songs and over-the-top characters. It wasn’t high brow, to say the least, but it sure was fun. I enjoy anything that parodies pop culture and this targeted more than just the book series. 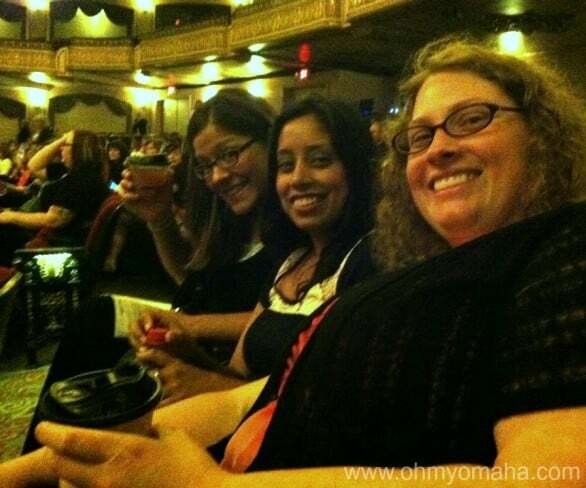 My friends and I had a fun time, sipping our girly drinks and blushing a time or two at some of the naughtier lines. Cheers to a fun girls night out! It was a fabulous girls night out, and having not made it through even one of the books, I didn’t miss a beat and enjoyed a night of skewering one of the most popular series in, um, literature. Could you use a girls night out? Or guys, want to win husband/boyfriend of the year and win your gal some tickets? They’re coming back! The terrible and hilarious author, the domineering Christian Gray-like character and the naive Anastacia-like character will return to Omaha. Omaha Performing Arts is bringing the sequel to the Orpheum Theater: “Spank! Harder.” It’s playing two nights only, June 6 and 7, at 8 p.m.
Want to see it with three of your girlfriends? You can win FOUR (4) tickets to see “Spank! Harder” on opening night, June 6. Giveaway ends at 11:59 p.m. on April 27. A random winner will be selected by Rafflecopter, and I will contact that winner via email with details on retrieving the tickets. Total value of the tickets is $180. I want to thank the sponsors who are making Oh My! 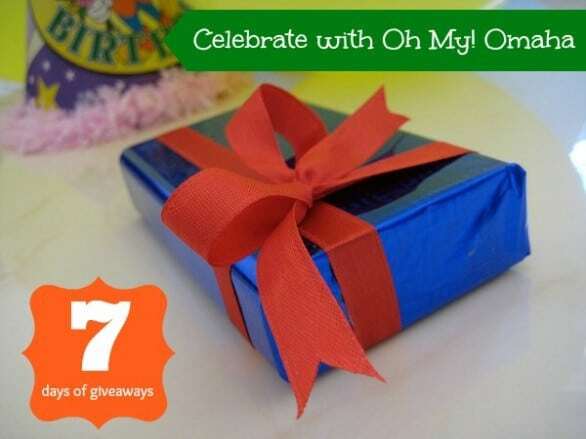 Omaha’s birthday celebration so awesome, especially Omaha Performing Arts for providing the tickets for this giveaway. Other sponsors for this week of giveaways include: Omaha Symphony, The Rose, Omaha Children’s Museum, Vino Van Gogh, the Strategic Air & Space Museum, and Bluebarn Theatre. Have you heard about the Omaha Symphony’s 14-15 season yet? One word: Pixar! The Family Series has been a great discovery for me this year. My kids love going to the pre-show activities before each one – there’s an instrument petting zoo – and then there’s the entertaining performance itself. If you haven’t gone to one of these kid-friendly shows, you’ve got to take your littles to one of these! The 2014-2015 season offers four Family shows at a kid-friendly time (2 p.m.) and at a family-friendly price. We went to the Spooktacular last year, and I highly recommend seeing it this year on Oct. 26! That show is followed by “Symphonic Space Odyssey” on Jan. 18, 2015, “Thomas’s Adventures in Music” on Feb. 22, 2015, and “Mermaids, Minions, and Dragons” on March 22. Oh yeah, I said Minions. My son is going to be in heaven. The Movie Music Series looks pretty cool next season, too. Check out what’s coming: “Monster Mash of Scary Movies” on Oct. 18, “Pixar in Concert” on Feb. 14, 2015, and “Casablanca” on May 23, 2015. You get to hear the score played live to the movies you’re watching. The “Monster Mash” one is right before Halloween and you’re invited to come in costume. 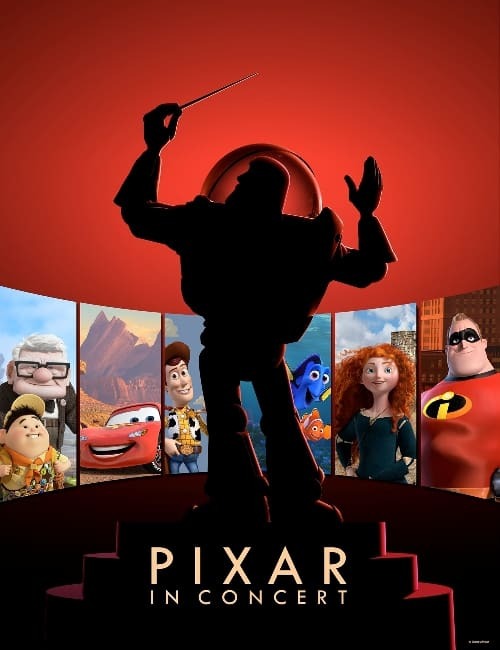 The “Pixar” one will feature clips from 13 Pixar movies. Kids will love that one! And “Casablanca” is, well, a classic to see repeatedly. Check all series offered by the symphony here. You like that Movie Music series concept? The Omaha Symphony will play the score live as the movie “Singin’ in the Rain” is screened on April 26 at 8 p.m. at the Holland Performing Arts Center. 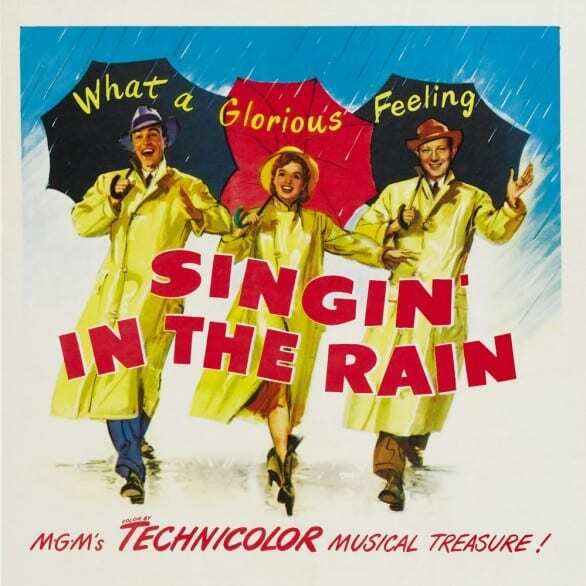 You love the actors – Gene Kelly, Donald O’Connor and Debbie Reynolds – and you love the songs, so watch this movie as never before. I’m giving away TWO (2) tickets to the show! And heck, let’s make it a complete date night. The Omaha Symphony has generously provided a $25 gift card to Upstream Brewery Co.
It’s easy to enter below. You can get extra entries if you follow us on Facebook, Twitter and Pinterest, plus you can tweet about this giveaway daily for an extra entry each day! Giveaway ends at 11:59 p.m. on April 20. A random winner will be selected by Rafflecopter, and I will contact that winner with details on retrieving the tickets. Total value of the tickets is $110. I want to thank the sponsors who are making Oh My! Omaha’s birthday celebration so awesome, especially Omaha Symphony for providing tickets and the gift card for today’s giveaway! Other great sponsors are The Rose, Omaha Performing Arts, Omaha Children’s Museum, Vino Van Gogh, and the Strategic Air & Space Museum. Until this year, March of Dimes’ March for Babies was on the periphery of my life. A friend out east walked in one with her preemie daughter; she had found a lot of support through March of Dimes. But I didn’t keep tabs on my local chapter. And then this little sweetheart came along. 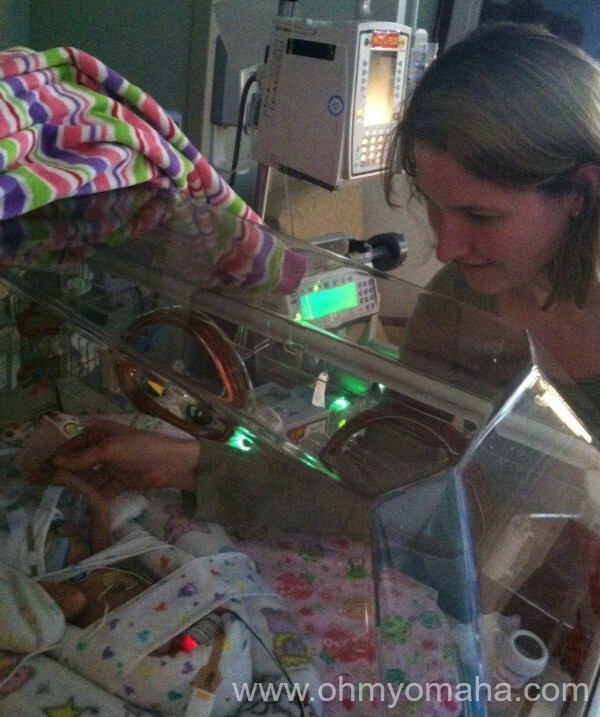 My niece, Sofie, was born at 27 weeks. So, that brings me to an event in Omaha that now has a little more weight in my life. 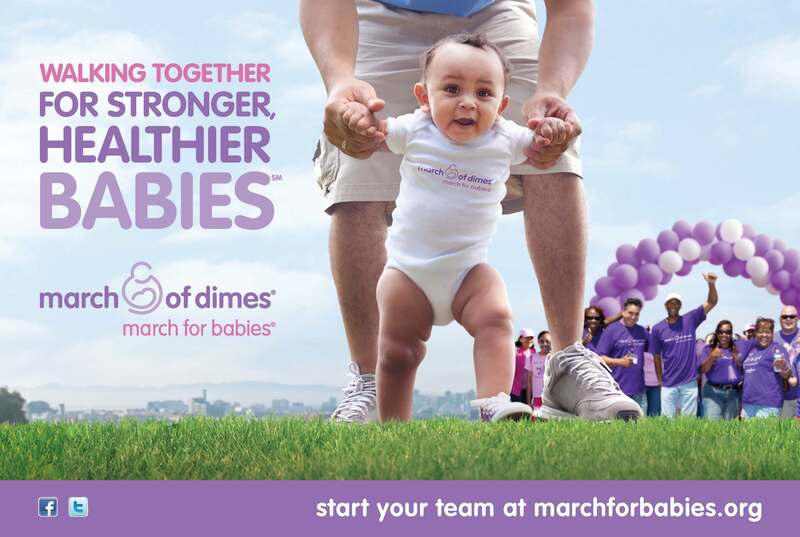 The March for Babies Omaha is Saturday, April 26, starting at the Lewis & Clark Landing, 515 Riverfront Drive. The walk begins at 9 a.m.; registration starts at 8. I’ve done charity walks there in the past and it’s a lovely route along the river. I already am committed to a 5K that day, so I cannot attend. But you should! Teams are forming now. You can register here. Farley and Mooch are at different stages in their language development. Mooch is just beginning to identify letters (D for daddy sort of thing). Farley is working on spelling his name. So, when I received a special delivery of Post Alpha-Bits in the mail for a special project (more on that in a second), I decided we could multitask in the morning. Eat and learn at once. Let’s do it. They’re going to play with their food anyway, right? My preschooler appreciated that his cereal not only has letters to play with but “Super WHY!” characters on the box. And, yes, that’s my kid in a Christmas pajama top in March. What of it? We started with the kids trying to find the first letter of their names, and then me nudging Farley to find the rest of his name. If your kids are older, you can work on distinguishing vowels and consonants: Ask them to eat all of the consonants and leave only the vowels. 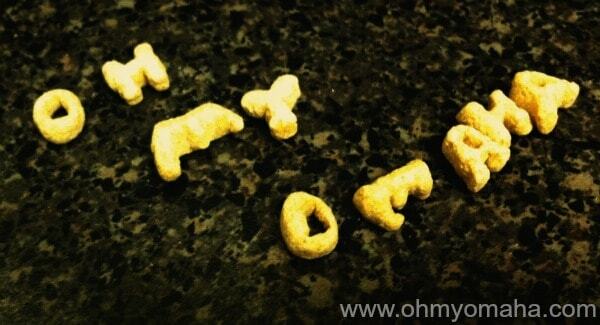 Grown ups can use the cereal for their own selfish needs, like advertising for their blogs. Side comment: Why is it impossible for find M’s?! 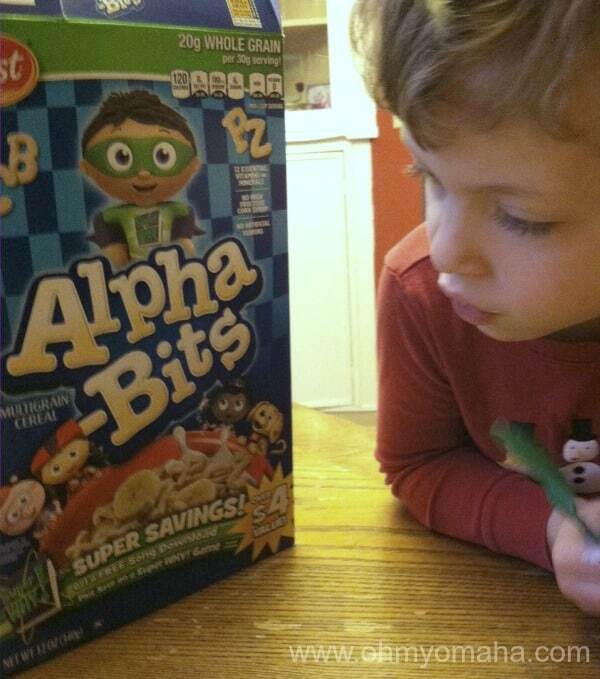 I’d never bought Alpha-Bits before; I figured it was like all the other sugary kids cereals on the market. Instead, there’s only 6 grams of sugar per serving – not too shabby. Plus, there are no artificial flavors and it has 20 grams of whole grain per 30-gram serving. The cereal also makes for a good ingredient in snack recipes. Microwave butter in large microwaveable bowl on HIGH for 45 seconds or until melted. Add marshmallows and soft drink mix; mix well. Microwave on HIGH for 1 to 1 ½ minutes or until marshmallows are completely melted and mixture is well blended, stirring for 45 seconds. Stir in cereal. Press cereal mixture firmly into prepared pan. Cool. Using the cookie cutters, cut 12-15 squares. 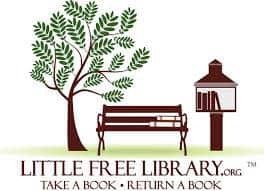 I’m partnering with Alpha-Bits and Little Free Library to put up a Little Free Library in my neighborhood. I’m pretty excited about it, because it’s a great way to share my love of reading with others. Each library is a small, free-standing structure (like a birdhouse almost) where members of the community add to it on an ongoing basis. There’s a lot to do before it goes up in the late spring. Here’s where it’s going up, though: Metcalfe Park. 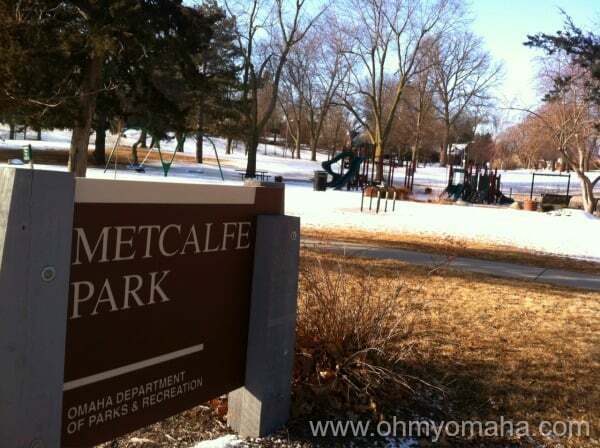 Metcalfe Park in Midtown Omaha will have a Little Free Library soon! One last thing … any artistic friends want to help me paint it? * This post was sponsored by Alpha-Bits, who provided the cereal and all of the materials to construct a Little Free Library, including starter books for it.